Live in the home you’ve always envisioned with services from Double Check Builders in Ronkonkoma, New York. In business since 1958, Double Check Builders, Inc. has professional experience in the construction of first- and second-floor home additions on a slab, crawlspace, or full basement. We specialize in Long Island home improvement and new home construction. Double Check Builders, Inc. is a family-owned and -operated home improvement business, originally founded by Morton Ilberman in 1958. Morton took Joe Walker on as an apprentice in the early 1980s. After Morton lost his battle with cancer in 1989, Joe took over as the owner and operator of Double Check Builders. In 2007 his son Matthew became part of the team and now he, together with Joe, handles all the daily operations. Our family-owned-and-operated company employs several crews of highly skilled and professionally experienced contractors in order to ensure all your home improvements, additions, interior alterations, roofing, siding, and windows are installed in accordance with New York state, Long Island, and town building codes. Plus, we provide services for blueprints, permits, and paperwork expedition. Double Check Builders, Inc. is a family-owned and -operated home improvement business of highly skilled workers ensuring all your homes roofing, siding, and windows, and improvement needs are met. Last summer when we began our journey, Matt and Joe were contractors. Today I count them as friends. I cannot say enough about the quality of work and service we received from Double Check builders. Their attention to detail, extensive knowledge and endless patience were extraordinary. Matt in particular was extremely responsive to all of our concerns. Our kitchen and bath remodels were absolutely beautiful and we couldn’t be happier or more satisfied. I’m writing to express my sincere thanks and gratitude for doing such an amazing job on renovating my kitchen. 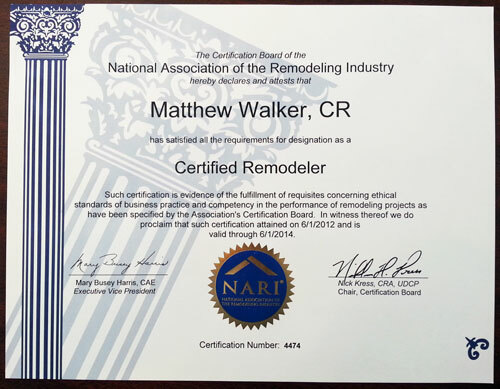 From the start, Matthew Walker was polite, respectful, knowledgeable and very helpful. Matthew enlisted the aid of Alex Pfitzer from Artistic Cabinetry to give us ideas of how to best utilize the existing space and helped us choose beautiful cabinets. I love my kitchen. Matthew set up dates of when certain phases of the kitchen would take place. He was always true to his word, showed up on time and cleaned up afterwards. All the contractors that worked on our house were top rate. I would not hesitate to choose Double Check Builders again for other house projects and I recommend them completely. Matthew and Joe Walker from Double Check Builders did a great job on my house remodel. They were professional, flexible and they stand behind their work. They took a vision that we had and created exactly what we were looking for. We have had the pleasure of working with Double Check Builders for many of our renovation projects in our home. Matthew and his father Joe are the ultimate professionals! They communicate with the homeowner on every phase of the project. Their suggestions on a project are invaluable. The work is performed in a professional, timely and expert manner at a reasonable price. We would definitely use Double Check Builders on any future projects and highly recommend this company. As someone in the industry, I know I had to my homework prior to hiring anyone to renovate my garage. Of the dozen or so contractors, Double Check was the only one that requested the paperwork on the house. They subbed out the majority of the work and the overall results were a good job. Double Check is made up of honest, hardworking people you can trust. I would highly recommend them, which means a lot coming from someone in the industry. You get what you pay for with them. I needed to have a room added on to my home for my son and brought in three contractors for an estimate. Double Check also came recommended from someone at my friend’s job. The cheapest price did not seem like the best idea and Double Check was competitive. We got a better feel for them than the more expensive contractor though the prices were close. The room came out great and David and his father worked well together. I think this makes a huge difference. I was very pleased with their work and would recommend them. I would like to take this opportunity to thank you, and your staff for helping my family and I through a difficult time. On February 3, 2013 , a car came through my kitchen. When the insurance company recommended I contact a contractor; I automatically called Double Check Builders. I had worked with you in the past(Second Floor Addition) and found your company and staff to go beyond basic support and professionalism at every instance. When this tragedy struck once again your professionalism, kindness and caring attitude during this trying time made this situation easier to bear. I would recommend your services to anyone who has suffered a loss or needs and addition to their home. My deepest thanks and appreciation. I did some research in finding a home improvement professional to build the dormer. 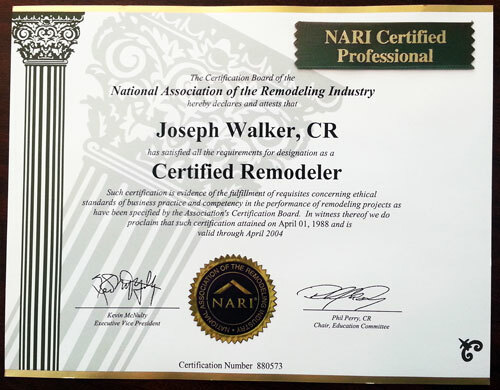 Joe Walker of Double Check was the President of a New York City-Long Island Chapter of NARI. He had an impeccable record and that is what mattered to me most. The job went terrific and there were no problems at all. I appreciated them being so local, allowing him to be on site very often. Double Check took care of all the necessary documents, permits, and CO’s with the town. I was fully satisfied with the results of the dormer build and would gladly recommend Joe and Double Check. Double Check Builders, Inc. has professional, experienced expediters on staff. The expediters are experts in acquiring permits and know the expectations and specific requirements that each building department mandates. We have two NYS notaries on staff for your convenience. How do I know what I can build? Based on your Long Island address and Suffolk and Nassau County tax map number, our staff can review your information and determine what zone you are in. based on that information, we can then review the zoning and building requirements in that particular zone and inform you as to what building and/ or home improvement can be done without acquiring a variance. What if I need a Variance? We are experienced in filing and representing clients in Variance applications. Double Check Builders, Inc. has filed and represented hundreds of clients throughout the over 40 years of our existence. Our expediters are experts in research of variance hearings and requirements. We have the “know-how” to get your project approved. Do I need an engineer or architect? For most medium to large projects, an architect will be required according to town code. We have a New York State licensed Architect on staff that can help in drafting your construction plans. If you prefer, you can provide your own drawings we can work from. All projects are unique in their own way. Our project consultants will meet with you in order to price your long island home improvement to your budget. We can break down the cost of the job in order for you to make an educated decision based on price and your needs. Double Check Builders, Inc. has been doing business on Long Island since 1958. Incorporated in 1966, we have been in Ronkonkoma Long Island, located on Ronkonkoma Avenue for over 40 years. All of our work is done by our trusted craftsmen in each particular field. We have been employing the same electricians, plumbers, carpenters, masons and more for over 10 years. Our workers are our most valuable asset. We have carefully hired and maintained skilled and professional workers in order to ensure your long island home improvement is completed in a timely fashion, with quality work and in a professional manner. What times/days do you work? We usually start work at 7:30 AM and will work till roughly 5:00 PM, Monday through Fridays. Depending on any specific project or need, we work on Saturdays (dependent on town regulations). Yes, we are licensed contractors in all of Long Island – Suffolk and Nassau Counties. We hold disability, liability and compensation insurance. In an effort to remove all liability for homeowners, we put the homeowner as a certificate holder for the duration of the project. Most of the building and home improvement will be completed by our own carpenters, framers and finish work specialists. Depending on the project, some subcontractors are utilized. These subcontractors have been working with us for over 5 years, and are trusted professional workers. They are labeled “subcontractors” basically for insurance and liability purposes. Can we do this in the wintertime? Most projects can be completed year around. We are experienced in the logistics of building extensions, dormers and second floor additions during inclement Long Island weather. It takes many years of experience in order to build these additions while it is very cold or very hot outside. Can I live at my house while the work is being done? Yes, 99% of our customers live in their Long Island homes while home improvement is being done. We have devised a specific and rigid logistical system in an effort to leave the house livable for a family while work is being done. Who do I go to for questions? The individual who reviewed, priced and contracted the project will be with you throughout the entire project. He will be on the job daily, and you will have his phone number and E-mail to contact him anytime to ask questions. We also have a team of certified re-modelers on hand to help answer any questions or address any issues. During your second or third meeting with our project consultants, we will be sure to review your needs and desires to ensure the proposed layout and style of the project is suitable for your family now, for your family in the future and for the re-sale value of your home. Do I purchase my tile/vanities/fixtures or do you provide them? We can work either way. If there is a specific item you would like to incorporate into your home, we can install a homeowner provided product. If you prefer, you can select from our large array of samples of tile, vanities and fixtures for your home. Yes, we have hundreds of references. The sales consultant will give you a list with names, phone numbers and addresses upon request. Can I see a finished product or project in progress? Absolutely, we can arrange a convenient time to meet at a job in progress or a finished home improvement project. Our sales consultants will be able to refer you to trusted professional individuals and organizations designed to acquire financing. Some of these loans are specifically designed for construction projects. What about Long Island town/state building codes? Double Check Builders, Inc. is a firm believer in adhering to all Long Island town and state building codes. All of our work is done to town and state code. We will schedule all inspections required for each project, meet with the town building inspector on the job to answer questions and ensure the forward momentum of the job. Is the salesman around for the entire job? Yes, the person who designed, contracted and organized the job will be with you for the duration of the home improvement project. Each job is unique and will take different amounts of time to complete. Our sales consultants will be able to estimate a timeframe in order to fit your schedule. We accept cash, check or certified check. Unfortunately, we do not accept credit cards. Will the jobsite be kept clean? Yes, we are adamant about keeping our jobsite, and your house clean and neat. What do we do in case of an emergency? Upon contracting a job, we will be sure to give you a list of emergency contacts in case you need to speak with us at anytime. Is there anything I have to do in order to prepare to commence work? All preparations for work will be done by us. We will section off specific areas of the home in order to keep dust and debris from living areas. We have a system in place in order to keep you living in your home while we are working on your home improvement. Do I have to be home for the improvement work to be done? No, you do not have to be home. We can work around your schedule to ensure the work is completed on time. We do recommend at least one of the owners visit the job-site daily in order to keep up-to-date on the job and its progress. Simple, complete the Request form, or call us at (631) 585-4444 to schedule your free, no-obligation appointment to meet our home improvement project consultants.